Missed PPA Restatement? | Farmer & Betts, Inc.
April 30, 2016, was the IRS deadline for employers to restate their 401(k), profit-sharing, or other defined contribution (not including 403(b) plans) retirement plans. Failure to comply with new regulations could result in significant IRS fines as well as loss of a plan’s qualified status. What if Plan Sponsor Do Not Comply? What if Plan Sponsors Missed the Deadline? The IRS has issued guidelines for plan sponsors who missed the deadline. To preserve their plan’s qualified status, they must submit their correction through the Voluntary Compliance Program (VCP). The VCP Submission Kit requires that several forms and documentation be submitted. Fees for filing range from $750 to $5,000 but may be reduced by 50% by completing the process before April 30th, 2017. For help completing your VCP Submission Kit, contact our office today. It’s important to understand that IRS approval of your VCP submission will not restore your plan’s qualified status if there are other failures in your plan, include not amending the plan for legislation before PPA, or not meeting required amendments for recent tax law changes. Additional steps are required to address those issues. 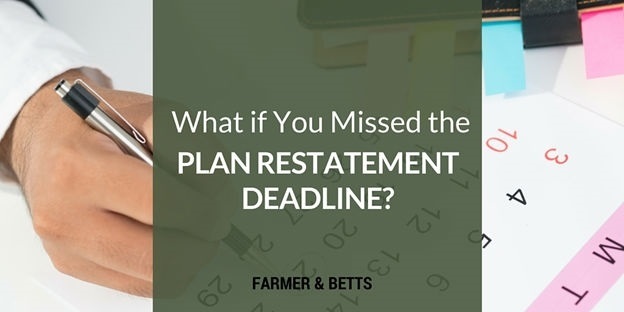 Do you have questions about the restatement deadline or the status of your plan? Contact our office today at 888-565-9887.